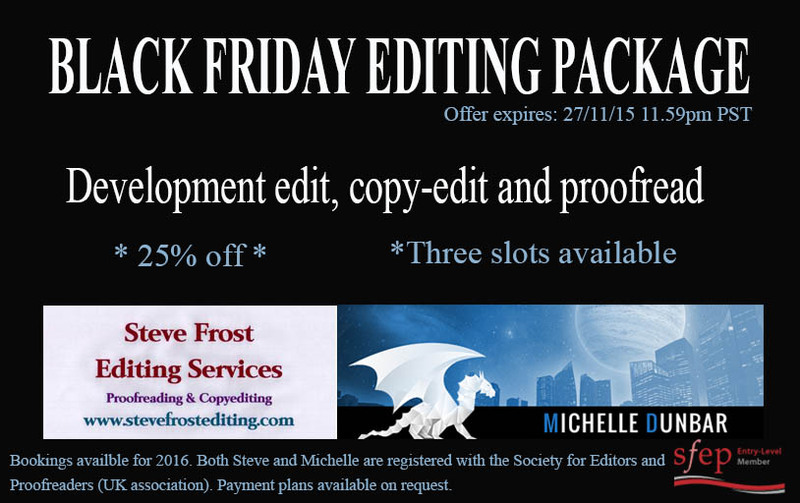 For just £825, your book will receive a full developmental edit, a complete copyedit and proofread. (Usual price £1,100). This offer is for works of fiction only and applies to book of up to 100,000 words. No erotica will be accepted. Both Michelle Dunbar and Steve Frost have booking slots available for 2016. After an initial discussion, Michelle Dunbar will complete the developmental edit in a period lasting no longer than six weeks. This stage will assess story, plot, characterisation, pace and tone, as well as highlighting inconsistencies and plot holes while preserving the author’s writing style. After the developmental edit is complete it will be returned to the author for assessment. The copy-edit with Steve Frost Editing Services will then take place after the author has resolved any issues raised in the developmental edit and will address sentence structure, readability, grammar, and punctuation. This part of the process can take up to three months to complete. Upon completion, the manuscript will be returned to the author for further assessment. The manuscript will be proofread by both Michelle Dunbar and Steve Frost. Prior to entering into a contract you are entitled to a no obligation on either side, five-page sample of work from both Michelle Dunbar and Steve Frost. The contract will stipulate the total cost of the services being provided. Half of this cost is payable fourteen days before the agreed date of commencement, with the remaining sum falling due upon completion of the services provided. Payment plans are available on request.